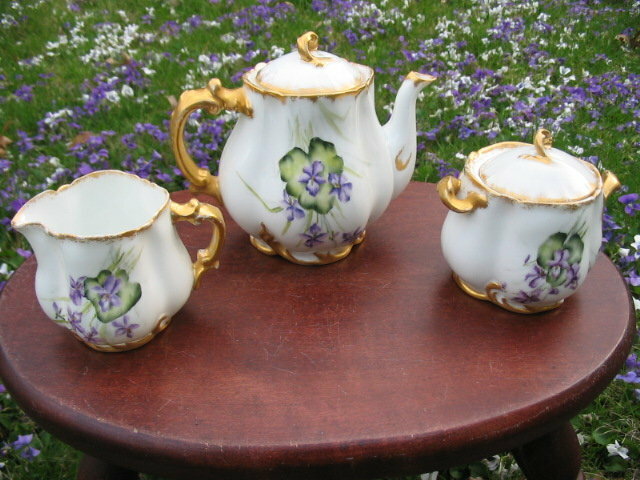 HERE IS AN EARLY BEAUTIFUL HAND PAINTED HAVILAND LIMOGES (H & CO) TEA SET FEATURING GORGEOUSLY PAINTED VIOLETS AGAINST AN ERMINE WHITE BACKGROUND. THERE IS LAVISH GOLD GILDING ON THE HANDLES. THE PORCELAIN OF THIS SET IS INCREDIBLY LIGHT AND TRANSLUCENT AND THIS SET IS ONE OF THE MOST BEAUTIFUL WE HAVE SEEN FROM THE EARLY HAND PAINTED ERA. 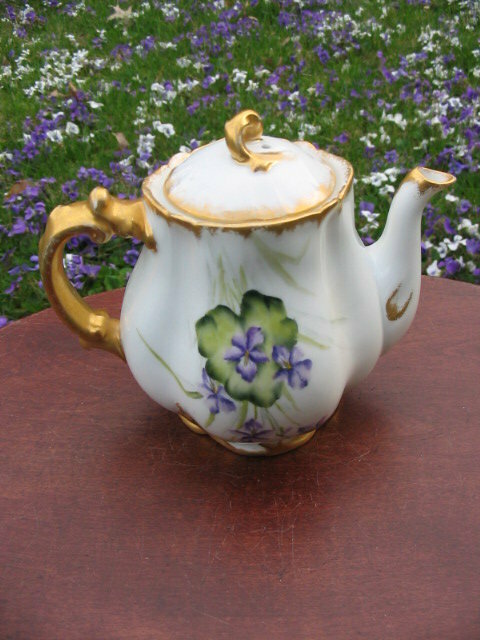 THE TEAPOT IS 5.25" HIGH AND 5.50" HANDLE TO HANDLE. CREAMER IS 3" X 4" AND SUGARBOWL IS 4" X 4". 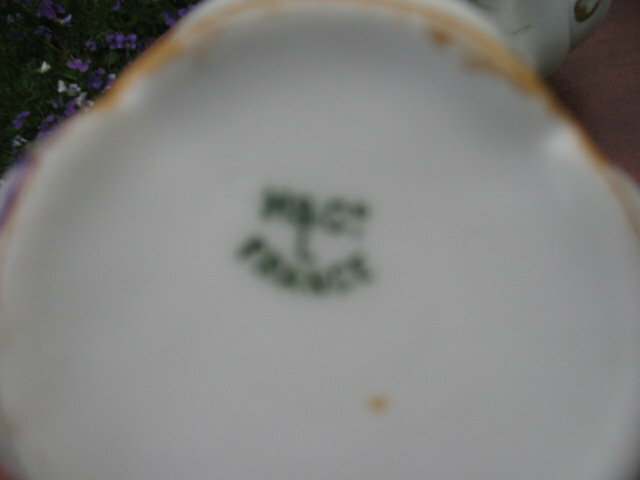 NO CHIPS CRACKS HAIRLINES OR REPAIRS; MINOR GOLDWEAR ON HANDLES. OTHERWISE PERFECT! 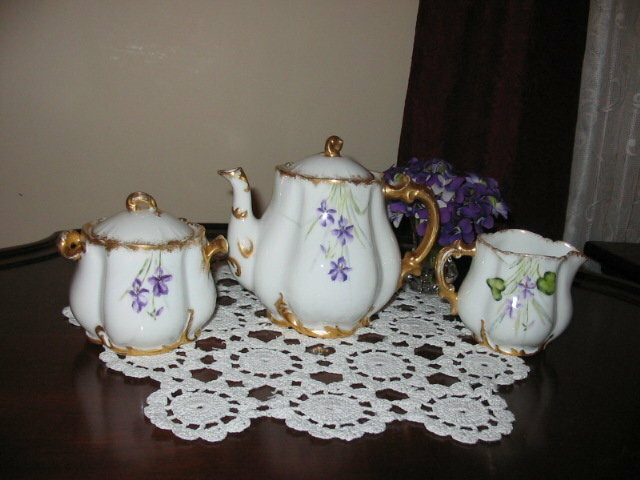 Items Similar To "EARLY HAVILAND H. P. TEA SET"